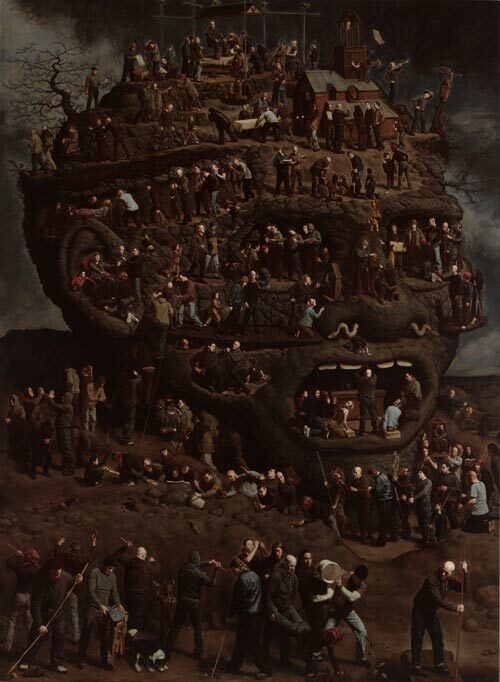 Marcus Wills’ painting The Paul Juraszek monolith was inspired by an etching called Allegory of iconoclasm by Marcus Gheeraerts the elder, a Flemish engraver, illustrator and painter best remembered as the illustrator of the 1567 edition of Aesop’s fables. Wills saw the etching in a book while researching for some paintings based on the apocalypse and thought he’d like to do something with it. Casting around for a subject for his own version, Wills thought of Paul Juraszek, whom he had met once or twice when they showed at the same gallery. Juraszek is a Melbourne-based sculptor who makes mostly animals from myths and legends. “As it turned out he suited the subject even better than I could possibly have imagined,” says Wills. Born in Kaniva, Victoria in 1972, Wills graduated from the Victorian College of the Arts with a Bachelor of Arts (Fine Art) in 1995. He has had three solo exhibitions in Melbourne and participated in various group shows. In 1999 he won the Brett Whiteley Travelling Art Scholarship and undertook a residency at the Cité Internationale des Arts, Paris. Artist Marcus Wills is among the other figures in the painting.